Great instructions Karel! After this, I think even I could make a furled leader! I was looking around the net for new line and saw this a few days ago. As a guy that like the idea of making things myself I loved this post. My next line will be a DeJong special. thanks. Joel - let us know your experience and how you like it. Thank you so much for posting this. I am wild about Tenkara fishing, but still have not purchased a rod. I was wondering about making my own line and you have answered that question. When I was looking at your example at the top of the page I was wondering if the decimal point was in the right spot(0.11 or 0.011)? Is a flat line just a single piece of mono or FC? Have you tried tenkara with a single stran tied line? like a long leader? A level line is nothing else than a single strand of mono or fluorcarbon line, typically somewhere in the 10-18lb range, depending on your preference. You can also tie a tapered line using just single strands of mono or fluorocarbon, weight and length to your liking. I was wondering if you had any special formulas that you like that you wouldn't mind sharing. I really like this method, but it would be nice to try some pre-tested effective variants. Richard - The formula I posted is an actual line I made, although a bit heavy for an Iwana 12ft it is nice for an Amago. For an Iwana, I would reduce the dia for each section by 0.01 or even 0.02 for the 11ft version. 3 sections at each 3-4 ft with a two furl for the tip (optional). Some of the very first lines I made were 3 sections at 4ft and they cast nicely. Again, it is all personal preference though. A heavier line will cast nice but "sag" and you won't be able to keep as much line off the water, a line too light and you will have issues in the wind. 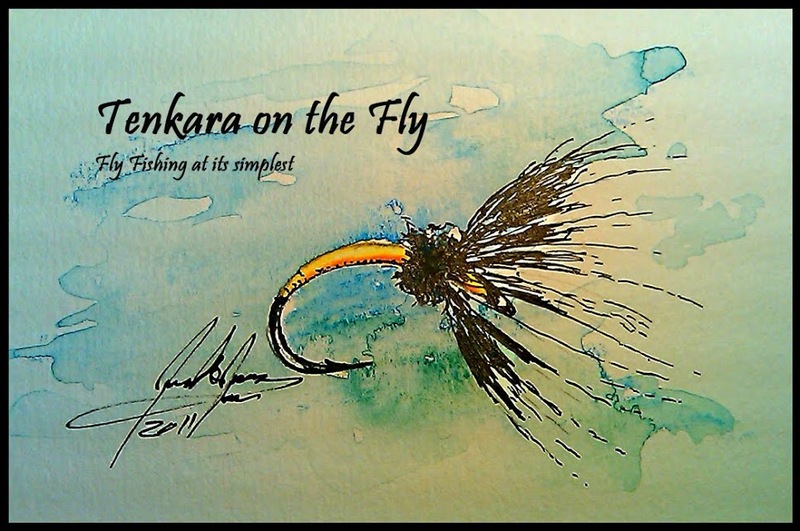 A friend of mine said "there is no perfect tenkara line" and I agree, it will always be a compromise. But with the option of being able to furl your own lines, you can make a line that comes close to perfect - for you. I've tried to furl a couple lines now, but about halfway through (1-2feet( a single line (usually the middle) twists around itself. which doesn't allow the line to rotate freely. Any ideas to fix this issue? Great instructional and nice steps on some knots, it always helps to brush up on ones knots, thanks! Before I cut up my tippet, how much does the line shrink, i.e how long are the strands before they becomes a 3 ft furled line? Hi Stefan, that is a very good question that I was asking myself too before I started furling the segments or "snoods". From my experience, the "shrinkage" is minimal and what I have been doing is to cut a 4ft strands for a 3ft section so that you still have room for knots (both securing the furl as well as knotting segments together). Hope that helps! do you know if there's a difference in the behavior between a 3 strands and a 2 strands furled line? Does a 3x0.10mm have the same characteristics as a 2x0.15mm? Hi Stefan, that is another good question which I haven't researched yet. In theory, I would think that a 3 strand furl would have a rounder cross profile and probably have less wind resistance but a 2 strand profile would be softer since each strand adds a bit of stiffness to the line (the upper part of the line should be stiffer to help it cast better). I have made 2, 3 and 4 strand furled sections using the 4 fingers and the thumb of my offhand as a line strand separator. Although it re-introduces using weights, I found that tying a knot near the end of each strand and attaching a clothespin helped a lot in preventing tangles with your mug method. You just drop the clothespin and attached line strand through each mug handle and then furl your line as usual when you are ready to begin making the furled line segment you are working on. Everything goes pretty smoothly until the clothespins hit and go out through the mug handles, then the strands will tangle. But by that time you already should have the length of furled line that you need. Taking the clothespins off of the line segments while holding the furled line segment securely makes it easier to tie the finishing knot in the furled line segment. Then the tangled section can be trimmed away and you have a completed furled line segment. thank you for this post!! After about a month of trying to figure out what line to buy, I decided it was too costly so I decided to make my own. I ran across your post and finally sat down tonight to try it out. After a short time I got the hang of it and I now have a 12ft furled line. Thanks!! This was a nice way to spend a Friday evening after a long week at work. Very relaxing!